These bite-size banana splits are fun to make and to eat! Made with our Mini Buttermilk Pancakes, they're the perfect treat to make with your mini-me! Cut bananas into thirds to create 12 big banana bits. Dip each banana bit halfway into a bowl of chocolate syrup and place on wax paper. Place chocolate-covered bananas in the freezer for 5-10 minutes until chocolate sauce is hard. While the bananas are in the freezer, heat up the De Wafelbakkers Mini Pancakes according to instructions on the package. Now you have all you need to start building your splits! To start, spread whipped cream topping on top of each Mini Pancake and then top with sprinkles. 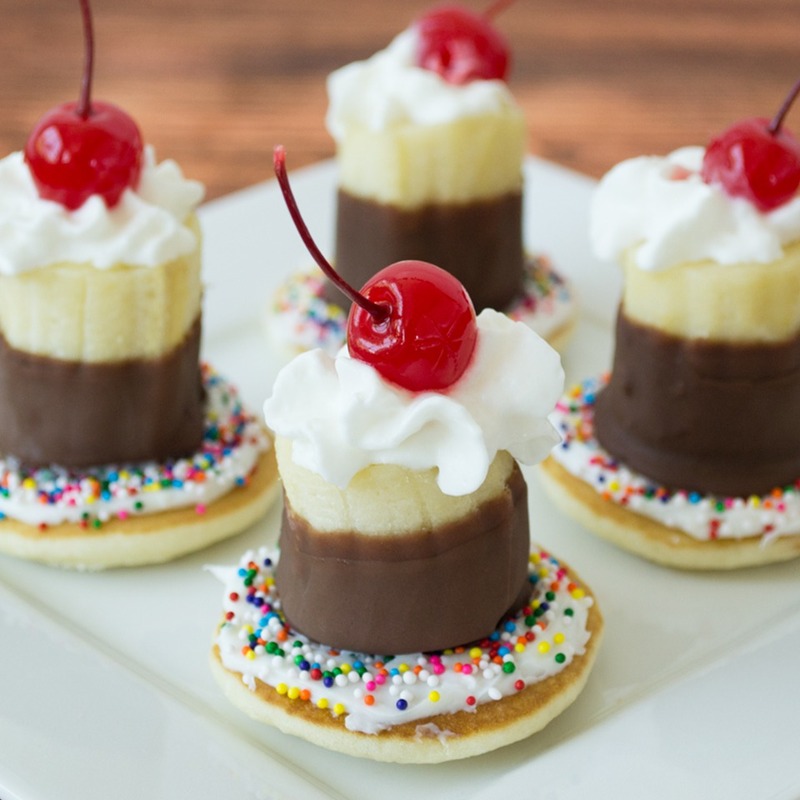 Grab the chocolate-covered bananas from the freezer and place each piece on top of the sprinkled whipped cream layer of each Mini. Dress it up with a bit more whipped cream and finish it off with a cherry on top.